The Lake of the Ozarks is a diverse area that has an excellent business environment and outstanding “quality of life” attributes. However, it needed a cohesive and cooperative effort to sell these advantages to potential business and industry. As a result, the LOREDC was formed to promote a regional approach to marketing the Lake Area. 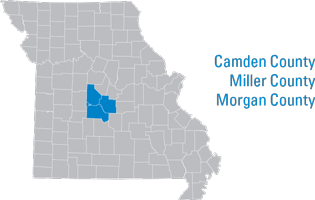 LOREDC consists of communities within a three-county region in Central Missouri – Camden, Miller, and Morgan. LOREDC is committed to serving the business community. Professional staff and experienced economic development representatives are available to assist with whatever challenges businesses encounter. Whether a business is new or expanding or just needs assistance, the Lake of the Ozarks Regional Economic Development Council will help. The group is striving to be a results-oriented team, committed to matching business needs with the best possible location and services with a creative financing package that helps companies with their bottom line and gain a competitive edge. Some services available include site and facility tours, research, financing, customized proposals, regulatory agency assistance, government liaison, workforce training and development, and business advocacy. LOREDC has been promoting the advantages of regional activities and support. One of its first major projects, with the assistance of Ameren Missouri, was conducting the Quality of Labor Study. The ability to quantify the amount and quality of the area’s workforce was an essential first step as it has provided the data for many of the subsequent projects.